What is the wilderness? Why do we label an area "natural" or "wild," or not? Local parks like Annadel and Armstrong Woods tend to be idealized as "natural" landscapes, but they have long histories of human use and management. Conversely, cattle pastures or vineyards, or suburbs for that matter, are categorized as "not natural," yet contain many species and ecological functions that tend to get overlooked through that labeling. 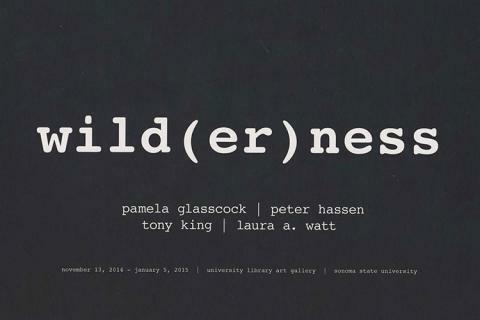 Wild(er)ness brings together the work of four artists, Pamela Glasscock, Peter Hasen, Tony King, and Laura A. Watt, each with a unique perspective on the meaning of wilderness.